Looking back on my recent posts, I see I have referenced William Blake's Jerusalem on numerous occasions. Why this should be, I am not sure, but it has prompted me to return imaginatively to my childhood and the first time I encountered those veil-piercing lines. It was July 1982, three weeks or so before our seven years at primary school ended. Seven years is a lifetime when you're a kid. I never thought, deep down, that I'd ever actually leave St. Catherine's. I knew in theory that one day I'd walk through those big green gates and never go back, but I simply couldn't believe in that day's reality. It didn't feel real. In my heart, I mean. I was too wedded to the place - the classrooms, the corridors, the library, the playground - the mise en scéne to so much childhood drama and adventure. More than anything, I felt emotionally bound to my peers - my companions, my comrades, my brothers and sisters in study and sport. I had no siblings of my own, and it upset me that my 'school family' would soon no longer come together under the same roof. September would see us all packed off to High School - the boys to St. Mark's, the girls to The Hollies, with interlopers from other South Manchester primaries - St. Cuthbert's, St. Kentigern's, etc - disturbing the unity and esprit de corps forged through more than half a decade of shared experience. It was with some sadness then, that I contemplated the annual school concert, scheduled as always for the last Wednesday of term. The concert ran - year in year out - for an hour and a half. The orchestra played (including myself as a second violin) and the choir (of which I wasn't a member) sang. The programme was varied - theatre, spoken word, reminiscences from former pupils and a distribution of leaving certificates from the Bishop of Salford himself. Every year, right at the end, the leavers would perform a special farewell piece. Twelve months before, we had been treated to the Daniel Jazz, ten minutes of bouncy choral speech recounting the story of Daniel in the lion's den. 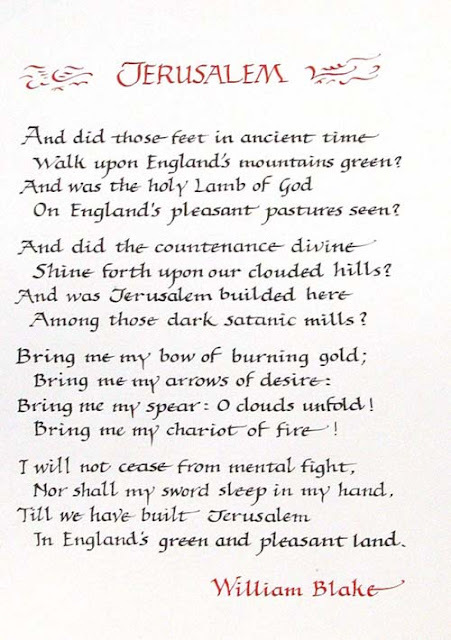 My year's offering (chosen by our Head of Year, Mrs. Elms) was shorter but possibly even more dramatic - the sixteen lines of Jerusalem in the setting made famous by Sir Hubert Parry, with piano accompaniment from our music teacher, Mr. Clarke. I was right about that. Jerusalem was a joy to sing. It really was. Our raw but eager voices boomed, echoed and rebounded around the Hall, bringing (for myself at least) a marked sense of release, of vast spaces - inner and outer - opening up. The melody's dignified, gently rousing lilt soothed and settled my mind while triggering a powerful longing for a depth and quality of being - both individual and collective - which I suddenly and starkly realised I'd wished for more than anything else throughout my young life but had so far only partially experienced, if at all. Blake's fantastic words - the molten lava of his language - 'countenance divine', 'clouded hills', 'burning gold' - had a poetic and spiritual potency which I had encountered in only a very few places - the Narnia books mainly, plus Roger Lancelyn Green's retellings of Greek, Norse, Egyptian and Arthurian legends. Mrs. Elms, to be fair, had told a few good stories in this mould too. 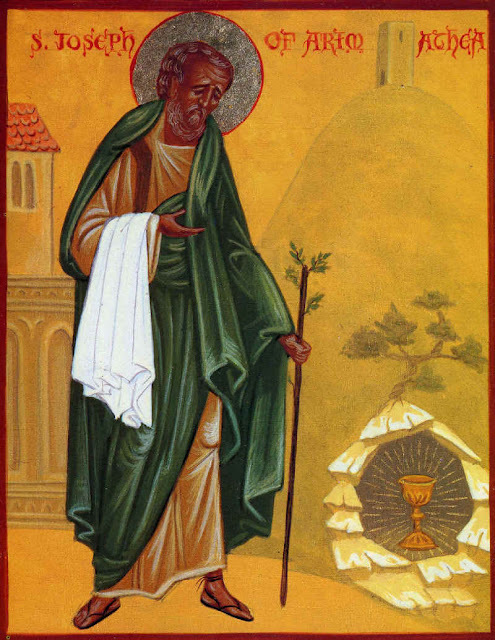 She was from the West Country and had often held forth about Joseph of Arimathea and how he'd brought the Holy Grail to Glastonbury and planted his staff on Wearyall Hill, bringing forth the miraculous thorn tree which flowers every year on Christmas Day. All these tales played a pivotal role in my life, giving me that mythic, archetypal sustenance which the somewhat desacralised, post-Vatican II Catholicism of my youth believed the world no longer needed. I was ready for Jerusalem, in other words, and when we sang it that morning it felt like I was coming home - to myself, to God, and to my friends - to that wider mystery I had always dimly perceived and had reached out for through both my reading and my yearning for camaraderie - a double-edged quest for a 'Round Table', if you like - all through my time at St. Catherine's. 'I will not cease from mental fight,' we sang, and the sun smashed through the windows, transforming the Hall into a golden bowl of warmth and light. I've always had a vivid imagination, it's true, but I swear at that moment I heard a voice in my ear. An old man's voice. Foreign. East European or Middle-Eastern. 'Before you leave this school,' it said, 'you will see the Holy Grail.' 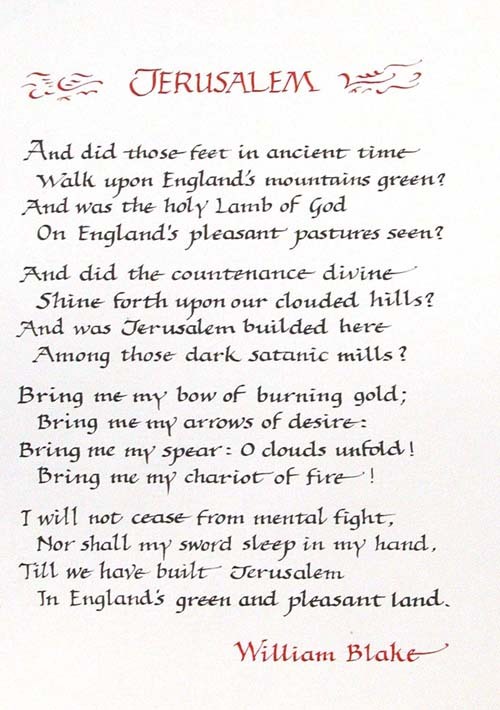 I was so shocked that I missed the next line - 'nor shall my sword sleep in my hand' - but made sure I was back on track for the last two - 'till we have built Jerusalem, in England's green and pleasant land.' It felt, all of a sudden, like a matter of life and death that I should sing those two lines loud and well. If someone had asked me why, I could only have replied, 'the old man expects it of me.' But who that old man was and why he had spoken to me, I had no idea at all. There was a violin teacher who wasn't employed by the school but came in to give individual lessons to pupils who expressed an interest. One of those pupils was me - not, if I'm honest, because I had any huge enthusiasm for the violin but because my Mum and Dad were keen for me to learn an instrument. They saw it as a badge of distinction and a distinguishing mark for myself as a working class boy in a largely middle class school. Miss Corcoran was the teacher's name. She was calm and grave, and though her name was Irish, like mine and many of my colleagues, she was actually Welsh - from Caernarfon - not far from the Castle, she said - and her voice was as musical as the instrument she taught. She was a smallish woman with brown straight hair and big silver earrings like hoops. Her eyes were brown and wide, her face as round as the sun in the sky, and the dresses and skirts she wore, unless my memory deceives me, were always blue or gold. She sometimes wore a headband too - usually green or purple but now and again white or pink. Miss Corcoran's lessons were a definite boon as they gave you twenty minutes out of the classroom every week. I liked the little lamp-lit music room at the end of the corridor too and felt at home in her company. She exuded in her voice and bearing a watchful, unspoken spirituality, and I came over time (two school years) to see her as something of a kindred spirit. My allocated time that particular year was twenty past two on a Monday afternoon, just before the afternoon break. I also recall that for reasons which now escape me I gave up 'private' tuition as soon as I went to St. Mark's. My lesson on the last Monday of term, therefore, two days before our concert, was the last one I ever had. I expected her to say something in reply but all she did was point with her eyes to the instrument in my hands. 'Let me play it for you,' she said, and I handed her the violin and bow. Without further ado she started to play. Jerusalem, of course. And for the second time that fortnight I was astonished beyond measure. She looked different. That was the first thing. Miss Corcoran usually played in the classical style, the violin jutting out from her chin at 90°. But a Gaelic fiddler stood before me now - violin slung low beneath her chin, bow clasped loosely in her hand. The tune was the same as the one I'd come to know. I recognised where the words went - 'And did those feet ...', etc. The feel of it was Celtic though, but hard to pin down. It felt like a lament in many ways, but one that was wild, exultant and savage all at once, its sadness caught, held, and taken up into a wide-ranging, all-embracing harmony and pattern - a visionary, healing tapestry of music. Miss Corcoran played, I listened, and the fixtures and fittings around us - the stools, the piano, the lamp, the music stands - began mysteriously to blur, slide and fade. I rubbed my eyes but their solidity did not return. They wobbled and wavered, grew bigger, then smaller, then vanished altogether, leaving me in a new and very strange setting. It was night and I was standing with a great throng of people around a roaring, leaping fire. The fiddler played on ('bring me my bow of burning gold') but out of sight now. I looked up. The stars were out in force. I picked out Cassiopeia and Arthur's Wain pinpoint bright against the inky sky. The air was cold and the warmth of the blaze welcome. Everyone was jostling towards it. I recognised a few faces - a couple of fellow-pupils - Billy Prince and Kath McQueen - one or two parents and even the odd teacher. But it wasn't the people around me that compelled my attention. It was the fire itself. I hustled my way to the front to see it more clearly. Everyone else just wanted to keep warm - rubbing their hands and turning up their collars - and that was fine, but I had seen something in the fire, something odd, something no-one else seemed to have spotted - figures moving about in the flames, little black silhouettes, about a score of them, at the heart and centre of the blaze. Jerusalem was still going, at the line 'bring me my spear', but I'd lost track of time and wasn't sure if that was as far as Miss Corcoran (if it was still Miss Corcoran) had got to or whether she was playing it over and over in a loop. I concentrated on the fire itself - a mighty curtain of heat and light - and the more I looked the more I saw, like I was watching a film - forms coming into focus and a story taking shape. People in cloaks and hoods were walking up a hill and at the top of the hill was a great tower. Their leader was old and bent and walked with a stick but moved nonetheless with purpose, direction and speed. The woman behind him held something bright and quivering in her hands - some kind of jewel, I thought - but it was hidden in the folds of her cloak and I couldn't be fully sure. The old man stopped at the tower, stretched out his right arm and touched it with his hand. As he did so he planted his stick into the ground and straightaway I was transported to another place. At first I thought I thought I was back where I'd started, in the little music room at school. This room was similar in size and shape, but that, I swiftly realised, was the only resemblance. It was a chapel of some sort, with six wooden pews in front of me, three each side of a central aisle of roughened stone. Seven tall candlesticks burned on the altar, which was also made of stone and built into the back wall. An aged priest in silver vestments stood facing it in silence. A blossoming tree, with leaves of orange, gold and green, illuminated the back of his chausible. Miss Corcoran, to my amazement, was standing to his right, minus her headband, and wearing a white alb with a yellow sun emblazoned on the front. But in her hands she held something brighter than both the candles and the sun - a luminous globe, constantly changing colour - from gold to silver to bronze and back again. The object's contours were concealed by its radiance and I couldn't tell exactly what it was - a chalice, a jewel, a plate or a bowl. But whatever it was, it filled the space - every square inch of it - with gold; a joyful, celebratory gold, which warmed and inspired my heart and mind, just as Jerusalem had stirred my soul so potently the day we first ran through it in the School Hall. As soon as the hymn flashed into my head, I heard it again and realised it had been there ever since I'd come into that place, though up till that moment, for some reason, I hadn't been aware. It was a choir now, male and female voices singing with verve, passion and skill. I had no idea where they were. The sound seemed to come from all around, ringing and echoing through the room. 'Till we have built Jerusalem,' they sang, and the priest turned and bowed to Miss Corcoran as she handed him the Holy Thing. 'In England's green and pleasant land,' they concluded with a mighty gust of triumph and hope. And then there was silence, the priest standing before the altar again and Miss Corcoran kneeling beside him. I knelt down too and waited. Something stupendous was about to occur. I longed for it and was sure of it. The priest lifted the Grail (for surely that's what it was) high above his head and held it there for a long time. Miss Corcoran bowed down almost to the ground, but I kept my head up - watching, waiting, hoping. I expected a bell or a gong at least but nothing happened at all. The priest muttered a few words in a language I couldn't understand and that was it. I thought I'd copy Miss Corcoran and bow my head and close my eyes in the hope the miraculous would feel compelled to appear, but disappointment was already setting in and I began to feel tired in mind and body. Weary to the bone, in fact. Maybe I fell asleep, or maybe I was already asleep and simply woke from a dream, because the next thing I knew someone was tapping on my shoulder with a stick. I opened my eyes and saw that it wasn't a stick but my violin bow. Miss Corcoran, wearing her usual clothes again, stood above me with my violin in her left hand and my bow in her right. Raindrops trickled down the round windowpane still, but there was high cloud and patches of blue sky now, as a shy, streaky sun splashed the music room with soft summer sunlight. 'Both,' she answered and undid her headband, letting it fall to the ground. Her hair fell down around her face and the sun streamed in through the window, circling her head with a halo of light which bathed the piano, stools, lamp, music stands and purple headband at my feet with the same warm, generous glow I'd seen suffuse every square inch of space in The Jerusalem Suite. I saw the glory of the Grail reflected in her eyes and wanted to ask a question about the old priest and tell her as well that a voice had told me I'd see the Grail before school ended. Was it Joseph of Arimathea himself then - as in Mrs. Elms' story - who'd spoken to me and who I'd seen in the heart of the blaze and in front of the altar? Maybe it was, but I was young and confused and easily daunted. It's one thing when you're eleven years old to curl up in front of the fire and lose yourself in paperback myths and legends, quite another when the Grail Maiden, or one very like her, steps out of the book and into the pages of your own life. I dropped my gaze and mumbled something inconsequential - don't ask me what, I've deliberately forgotten - but whatever it was it wasn't the question I wanted to ask. I'm not sure how our conversation ended either, but when I closed the door behind me and looked down the corridor - ablaze from end to end with bars and shafts of golden sun - I understood that a door had shut on me in more ways than one. The bell rang for afternoon break and I knew that the moment had gone and I could never go back. I can't recall now if this filled me with sadness or relief or a mixture of both. I saw Miss Corcoran at the concert, of course, and she smiled, shook my hand and said well done. But her congratulations were lost in a welter of back-slapping and hair-ruffling. We had sung beautifully, apparently, but the whole thing had fallen a bit flat for me, if I'm honest. And in truth, how could it have been anything other than an anti-climax after such an epiphany just two days before? People, I recall, were pouring out of the Hall into the warm summer night. Not all at once though. As happened every year, some (mainly pupils) made a quick getaway while others (mainly parents) lingered. So that's how I came to be standing in the playground with a group of close friends - Pat Finn, Billy Prince, Kath McQueen, Harry Hanrahan and Cara O'Toole - all waiting for our folks. I had given up on the miraculous and was happy just to enjoy the chit-chat. 'Definitely,' I assented. 'Let's do it.' I was impressed. That was exactly the kind of thought I could and maybe should have had myself. From where I was stood I could see past the gates and onto the street. I spotted the Bishop, still in his mitre and robes, getting into a big car and disappearing into the night. Then I looked up. I hadn't noticed before how laden the sky was with stars. There, just above Cara's head, was Orion, there Cassiopeia, and there Arthur's Wain. I tuned back into the conversation. Kath was suggesting that we buy the teachers presents. Harry agreed while Pat demurred. I wasn't sure myself, but then the extraordinary burst in and I heard the old man's voice again, loud and clear, but in my heart this time, not my ear, right at the core of my being. Those, I perceived intuitively, were the words he had spoken in The Jerusalem Suite that I hadn't been able to understand. Those words should, I suppose, have given me sustenance and support throughout my life, but for many years after that night, until about half-way through my time at University, I found them more of a burden than a blessing. I hurtled through one experience after another, wishing and hoping that the 'appointed hour' would come at once so I could experience a supernatural thrill to go with all the other thrills one searches for at that age. Then, in my twenties and thirties, I switched tack and wrote The Jerusalem Suite off as wish-fulfilment and the product of an over-heated imagination. I don't know why, but I don't think that way any more. Nor do I think about it the way I did as a teenager. Both stances seem simplistic and naive to me now. Things like this take time, you see. They can't be rushed. It's not for us to force the pace, not for us to know the times and seasons. Our role is to watch, wait, work, pray, and hold the flame aloft in a dark time. We are the lantern bearers - the watchers in the tower - the golden builders of Jerusalem. We hold in our hands the seeds of an all-encompassing renaissance - social, political, cultural and religious. I'm coming to see that it's only when we're engaged at this level - living from the core and centre of our being - that a true Round Table can be built and a meaningful connection established with the Divine and with those around us. From there, all things become possible - renewal, restoration, healing and rejuvenation. Space is created and the the secret voice is heard, listened to and acted on. The bells peal, the gong sounds, and the waters flow down onto the land, bringing fertility back to the barren places, illuminating hearts and minds, and filling the whole wide world with gold - a warm and generous glow, joyful and celebratory. A person's life, in its innermost essence, is a quest for the Holy Grail - a voyage to the centre and a journey to Jerusalem. The Heavenly City will only appear, however, when we are ready and when the time is right. The dawn cannot be rushed. It comes at its own pace - when it's meant to and when it's most needed. At the appointed hour. The darkest hour. In the silence and the stillness of the night. Note - It has taken me over a month to write this piece. In that time both Bruce Charlton and William Wildblood have published posts which bear directly on its subject matter. I'm unable to provide links unfortunately but the relevant posts are William's The British Myth (Friday November 3rd) and Bruce's Blake, Albion, Jerusalem and the Nature of Prophecy (Wednesday October 18th). Both these posts can be read in conjunction with the above and both shed great light on these eternally fecund themes which continue to inspire and engage all of us following in Blake's footsteps - working and praying for a spiritual rebirth in this land. St. Joseph of Arimathea, pray for England. Well, John, all I can say is that Miss Corcoran was right. You have become a bard. That's a lovely, evocative piece.